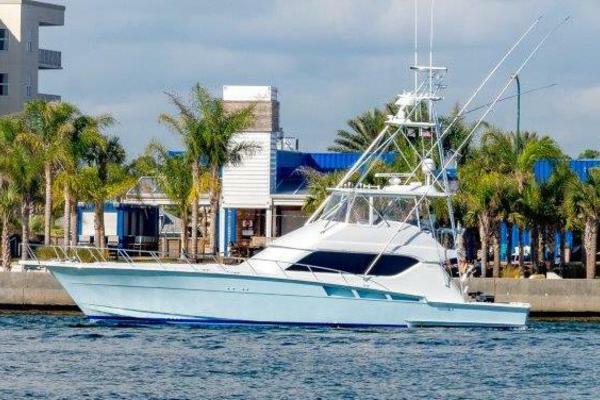 ***Trades Considered*** Beautiful custom sportfish, featuring4 stateroom / 3 head layout with teak mezzanine. 2400 HP MTU M93 engines, easy 38 kt cruise! 44.5 kt top end! One of the finest Weavers built. Highly customized interior. (2) 25 kw Northern Lights generators, Eskimo icemaker, watermaker, SAT TV, teak bulkhead, engine room cameras, bow thruster, LOADED! Updates December 2015New salon ice makerAll new A/C'sNew Eskimo ice machineNew injector upgradesNew softwareAll heat exchangers and after coolers servicedEngine service up to dateNew varnish Call to set up a sea trial and experience the unbelievable ride for yourself. United Yacht Sales New Jersey would love to guide you through a personal showing of this 68' Custom Weaver Sportfish 2008. This yacht for sale is located in Port O'Connor, Texas and priced at $3,490,000. For a showing please contact us by filling out the form on this page and we will get back to you shortly! Corian countertop with teak bullnosing-below are (4) sliding drawer storage for china, etc. Laundry center features a front load dryer and a top load washer,both Whirlpool units. The foredeck is totally uncluttered and has only two small and one larger bowmar hatches as well as an anchor locker. The toe rails are bright teak. (3) 15” VEI screens for Furuno Navnet sounder/plotter and depth sounder,black box for engine room cameras, hot eye, radar, color machine. Each screen can be interchanged for use. The plotters are driven by Navnet GPS and Max-Sea computer system. New 12 volt computer and new Max-Sea time zero (4/2014) and Weather World XM weather. ICOM VHF, Furuno Navnet 10” screen with 72 mile radar, plotter and color sounder, AP 20 Remote Autopilot. Name does not convey with boat. Also excludedis all fishing tackle and any personal items. Any items not on this listing may or may not be included.